UDC’s structural steel fabrication & sheet metal division can perform projects that range in size as well as complexity. From metal machine guards and duct work to seismic upgrades and metal building construction. 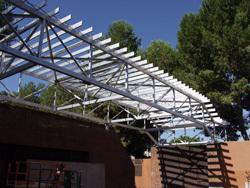 UDC Corporation has become one of the most diversified and respected industrial structural steel fabricators & sheet metal contractors in the Southern California area.